Who Are You Willing to Be? I’ve been reading Bart Ehrman’s book, How Jesus Became God: The Exaltation of a Jewish Preacher from Galilee, over the last few months. I’m taking my time. It is a book that I think people who identify as Christians should most certainly read. It took Ehrman, a NT scholar, eight years to research and write. The main purpose of his book [to quote Ehrman] is to explore how an apocalyptic prophet from the backwaters of rural Galilee crucified for crimes against the state came to be thought of as equal with the one God Almighty, Creator of all things. The book leads the reader through the history of thought about divine beings and humans who became divine beings—focusing of course on Israel and Palestine and the time periods relevant to the writings in the Hebrew Scriptures [OT] and the New Testament Scriptures. Jesus, according to Ehrman, was transformed from a human prophet to the Son of God exalted to divine status at his resurrection. But this transformation happened because of how other people defined Jesus over the centuries. The closest followers of Jesus did not recognize him as divine until well after his death. And if you read the Gospels closely, not even all the writers were sure about Jesus’ divinity. This could be a discussion for an entire year…or for a lifetime. I recommend that you give this book a chance. At the very least, it will open your mind to the possibility that most of what you have been taught or what you have learned about Jesus comes strictly from your particular church traditions, denomination, pastor, or some creed. People in the Gospels tried to define Jesus—all of them had different ideas. People in the 2nd, and 3rd, and 4th Centuries tried to define Jesus. Creeds again. And after that, more and more people defined Jesus’ identity. The Middle Ages. The Reformation. Liberation Theology. Missional Theology. It never ends! And so, here is the thing I want you to do. Just ask yourself this question, and answer it honestly, okay? Don’t let someone else or a denomination or a church or a pastor answer for you. Who is Jesus to you? And why? Identity [and not just Jesus’ identity] is really at the heart of the Gospels of the NT. Matthew and company all tell stories about Jesus of Nazareth, but in different ways; they all paint a unique picture of this man of Galilee. 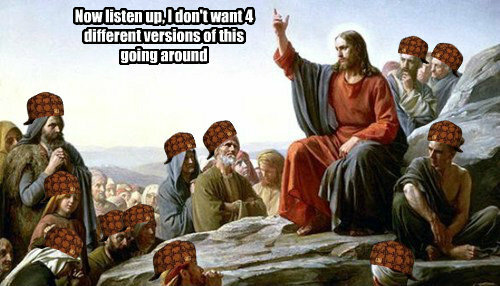 This is what I like about the Gospels, actually. There is not “one” tried and true definition of who Jesus was and is. The Gospels are more interested in telling the story of how communities formed around the teachings and life of this Jesus, and how people’s identities were formed. Think less about doctrine and more about formation. Who is Jesus relates to who am I and who are we and what shall we do in this world? Specifically, in Matthew’s story, identity is not just about who you are but who is around you. There is collective identity that goes hand and in hand with your own identity. Jesus was clearly preaching such a message. If someone knew who his/her neighbor was, then he/she had a chance to know themselves better. And for Matthew’s community, they formed identity in a certain time and environment. We can never forget that those who followed Jesus of Nazareth were living under the Roman Empire. The Roman occupation of Israel was on everyone’s minds. Would Jesus be the political leader to overthrow the Romans? 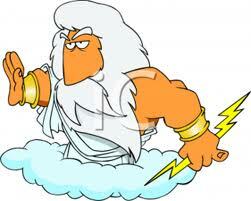 Would he restore the Israelites to power over that land? None of that actually happened, did it? Jesus died. The Romans still had power. The predictions of God coming back to save and restore a new kingdom did not happen. People’s definitions of Jesus as king did not come to fruition. This should not sound unfamiliar to us. In this place and in this age, do you notice how empires still rule over us? Ancient empires like Rome did indeed fade away, but new ones with different names are imbedded in society. Armies and political structures exist, things we ignore or accept blindly as reality. We are placed in social levels, given categories and boxes into demographic stereotypes. Empires can trick us; they can tell us that we are not worth much, and neither are certain others around us. That’s how Empires oppress; they mess around with our identities. They run in with SWAT teams and heavy armor and guns. They hurl tear gas at peaceful protestors. They criminalize people based on skin color, nationality, or religion. They silence truthful voices. They push back justice-seekers. They favor the materially wealthy and powerful. And empires use fear to cause apathy, to calm passion, and to push us to forget who we are capable of being. 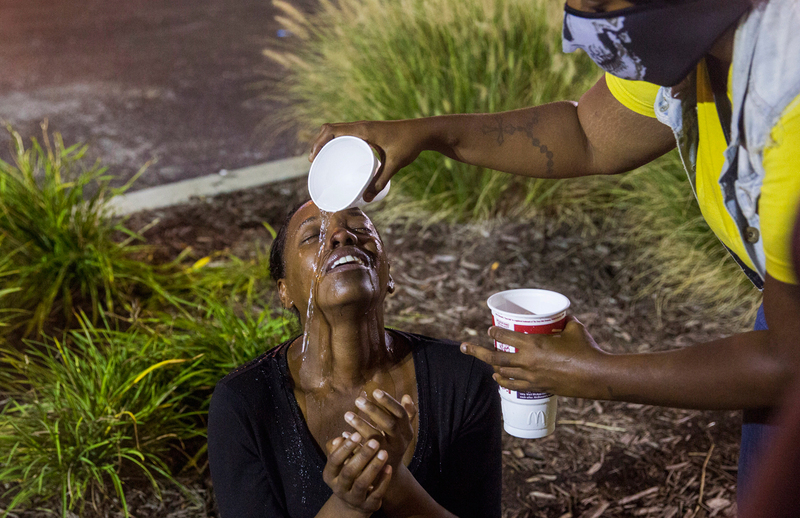 In Ferguson, MO and all over this country some people call the “land of the free,” young Black men are killed. This is not about criticizing all women and men who are police. This is about telling the truth. Young Black men are targeted, arrested, and sometimes even dealt with violently or fatally. We cannot ignore this. In Gaza, children die because of bombs. These bombs are funded by the U.S. and other countries that have political and economic interests in Israel and Palestine. We cannot ignore this. In Iraq, soldiers, drones, and heavy military presence of the U.S. and others continue. People are dying. And people of particular religious traditions or cultures are being pushed out of Iraq or even killed. We cannot ignore this. Just like we cannot ignore the identity question. If so, what part of the Jesus message moves us to identify with others who suffer? Which part of that message helps us to be more human as we are? Does our faith/spirituality inspire us to be love/mercy for others? The I AM of Jesus and the I AM of all of us is about deciding who we are willing to be. Are we willing to stand up against injustice, no matter how uncomfortable or unpopular? Are we willing to tell the truth and lift it up, even when others do not want to hear it and seek to hide it? Are we willing to take a risk and befriend someone, even love someone who thinks differently or looks differently, because we simply value their humanity? Are we willing to be real about society’s evil empires, the prejudice embedded in them, and our sometimes apathetic response? Are you willing to answer this vulnerable identity question with action? To close, if you haven’t seen this, watch it. Orlando Jones’ take on the “ice bucket challenge” speaks loudly. and to reserve the hate. Here’s how this story goes: Jesus just got tested in the wilderness. He then returns to Galilee after his cousin John is arrested for eating too many locusts; or something like that. 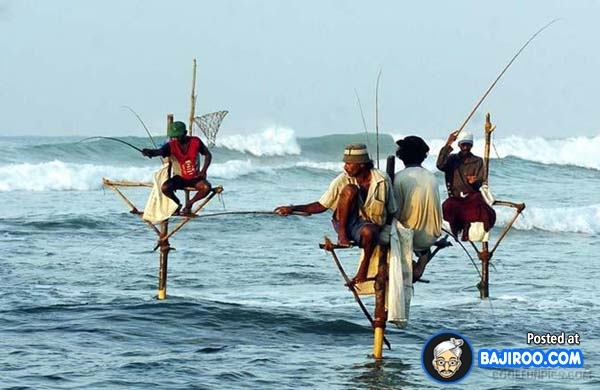 Then Jesus finds two willing fishermen and begins an adventurous journey with them. This story originates in Mark’s Gospel. Matthew mostly copies Mark, but also adds the Isaiah reference and changes what Jesus is quoted as saying, eliminating The time is fulfilled and changing the kingdom of God to the kingdom of heaven. Also, Matthew leaves out the bit about Simon [Peter] and Andrew leaving their hired hands behind along with their dad in the fishing boat. The story takes place in Capernaum–a major port city. It was a great trading and meeting center. 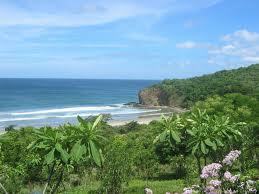 It would have been a great locale in which to spread news or to communicate with a wide variety of people. Capernaum is on the northwest shore of the Sea of Galilee [actually a lake, as you can see]. But the story also references Naphtali and Zebulon. This is less geographical and more cultural. Naphtali and Zebulon were the names of two tribes of people who lived in the northern region of Israel [also west of the lake of Galilee]. But there will be no gloom for those who were in anguish. In the former time he brought into contempt the land of Zebulun and the land of Naphtali, but in the latter time he will make glorious the way of the sea, the land beyond the Jordan, Galilee of the nations. The people who walked in darkness have seen a great light; those who lived in a land of deep darkness— on them light has shined. Isaiah says by way of the sea [meaning the Mediterranean Sea there on the left] while Jesus in Matthew’s story traveled by the Sea [or Lake] of Galilee. Keep in mind that while some love to jump to prophetic conclusions and put two and two together by using OT passages to predict NT Jesus events—this alters the spirit and meaning of the story. Matthew uses the Isaiah reference [and geography and culture] to show that Jesus didn’t just care about the Jewish people, but also about those who were called Gentiles. We are supposed to notice the Zebulun and Naphtali reference and also the phrase repent for the kingdom of heaven is near because John said that earlier in the story in the wilderness of Judah [Jewish land] and now Jesus was saying the same thing in the Northern territories where there were more Gentiles. You see the movement of the story? I hope this helps. Let’s continue on the journey. 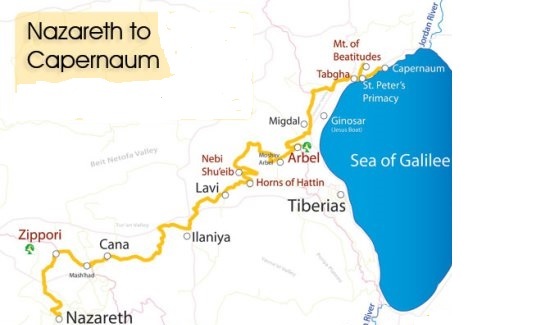 Nazareth to Capernaum was about 26 miles, depending on the route one decided to take. Put it in context. 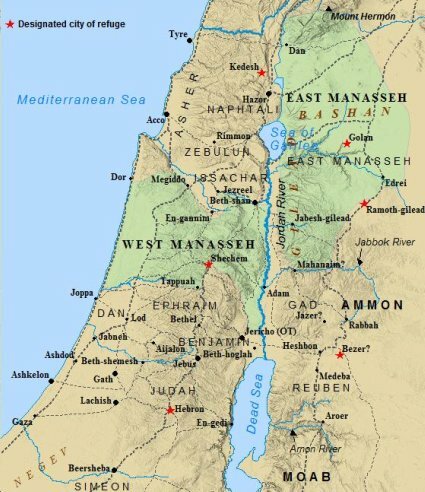 If you traveled from the address of the United Church of Christ in Warminster, PA to where the University of Pennsylvania is in University City, you have just gone from Nazareth to Capernaum. Yes, keep in mind that most of the stories about Jesus take place in a very small geographical area. So we have journeyed to Capernaum and we’re on the shore of the Lake of Galilee, there is fresh water and lots of fish. The lake is controlled by the wealthy Greeks and Romans and Jewish folk who were in with King Herod. Fishermen worked for them. Yes, that’s right—local fishermen had to buy fishing licenses just so they could fish. It was all regulated and of course, everything, including the fish, was taxed. Much like today, those who worked tirelessly raising crops on land or those who fished the sea–sadly they saw most of their food exported to other lands and they gained very little for their own families. It is to this group of people that Jesus appeals. Keep in mind that in Matthew’s Gospel and the other three, the issue of debt and money comes up a lot. We need to notice this in the story. Why would they fish for people? And why did the other people go in the water in the first place? Uh, yeah. This is a weird thing to say: go fish for people. That’s why I really believe that details in a story are important. You see, we often see this Biblical story of calling disciples as some up-in-the-clouds, impossible tale. And so we are disconnected from it. But like most of the stories about Jesus, this one is quite ordinary and human, and therefore it is a story with which we can identify. I still have a question, though: why did Peter and Andrew listen to this Jesus of Nazareth, leave behind their fishing equipment, and then follow him on a crazy adventure? Why? I think most people assume that these two guys just picked up and left their previous lives to make some sort of incredible religious commitment. Many look at any story and assume that anyone who follows Jesus has to drop everything and make an overwhelming pledge to change their lives completely. Perhaps that’s why there are so many people who relate Christianity to fanaticism. And they would be right, in many cases. But I’m certainly not criticizing people who really do need to drop everything because they may live destructively and need this type of major change. Certainly, I have known people for whom practicing the Christian faith helped them to overcome addictions or destructive behaviors that kept them from living full lives. I don’t underestimate the joy and healing they discovered. But I think everyone’s experience is different. And I also think that religion itself is so very limited and also created by us, so being “called” or “following” Jesus will look different for every person. Your life is a calling. You don’t have to be a fisherperson, a pastor, overtly religious, or someone who experiences an enlightening moment or a conversion. Your life, from its very beginning, has been and is a calling. But yes—we are called to live with more imagination. And with more love. And with less hate. And we are called to live with more mercy, forgiveness, and more honesty. And we are called out of comfort and into conflict, recognizing that the conflict leads us to meet new and amazing people who will journey with us. Along the way, we start to realize that comfort is overrated. We can even find strength to leave it behind, as well as all the attachments to material things and prejudices that limit us so much and keep us from living a full life. And yes–we’re called out of fear to love—a very difficult calling, for sure, because we are called to face our fears and to stop ignoring them or running away from them. And all of this looks so different for each and every person, doesn’t it? Recently, the Lilly Foundation, an endowment organization that funds religious research, interviewed pastors, seminarians, church and ministry leaders, etc. about their careers. The study found that most of these people felt called to their vocation. Okay, but the problem is that most people don’t feel the same way. They don’t feel called like most pastors do. They hear sermons and read religious stuff but often they don’t think that what they do outside of the church has much to do with some calling worthy of God’s attention. Most people see Peter and Andrew or any of the other 1st or 2nd century disciples as super Jesus followers and faith heroes who they could never measure up to and with whom they cannot identify. Well, that’s a big problem. We are missing the whole point, then. I mean, it’s all well and good to interview pastors and seminarians and other professionals, but being a pastor myself, I see great limitations here. Look, personally I do find joy and fulfillment in my work as an ordained minister—both with UCCW and also with the Interfaith Center. But my “calling” [vocation] is not any higher or more worthy of God’s attention than anyone else’s. I don’t think of what I do as more Christian or more faithful to following Jesus. 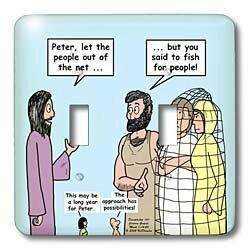 And no, I did not put down my nets and follow Jesus like Andrew and Peter. I just didn’t. For as long as I can remember, I’ve tried my best to be myself and to treat people well, and to love fearlessly and to speak and act creatively and compassionately. But that has zero to do with me being a pastor. That’s just my life. And for me, following Jesus’ life and teachings has helped to make me a better person. It has helped me forgive and help and empathize and heal. Your life and calling is just as special as mine. Look, this Lily Foundation study discovered something much more important than what religious professionals think. They found that all these people had the greatest sense of fulfillment, meaning, and purpose—not because of their religious jobs–but because of their relationships. In Matthew’s story, Jesus doesn’t call the two fishermen [or any others for that matter] to change jobs. Jesus instead calls them into relationship. 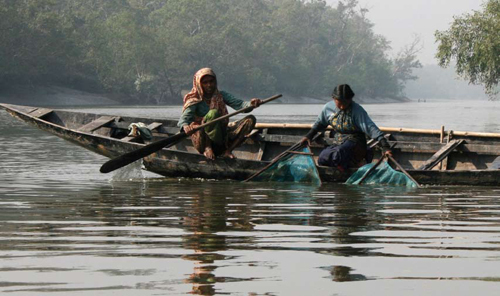 They are to be fishers of people. And while this sounds weird to most of us because we are not casting nets, you get the idea. We are called into relationships and we always have been. Your relationship with God, with this, Jesus—should be a good thing. It should add joy, healing, wisdom, wholeness. It should not limit you or take away your playful imagination or your creativity or make you think that you need to change who you are. No way. Likewise with your relationships in this life here on this planet. You should be challenged, uplifted, inspired, strengthened, and fulfilled by your relationships with people. Others should feel the same when they are in relationship with you. And no, you don’t have to have some really religious conversion story or some so-called “higher” calling to do that. No way. Just be you. How will I step out of my comfort zone and be in relationship with others? How will I be a compassionate friend? How will I be a loving partner? How will I be creative, free, and joyful at work and at school and with others? How will my relationship with God inspire and heal me? How will this relationship with God move me to healthy relationships with others? Baptism stories are always fun to tell because if you think about it, what is stranger, funnier, or more awkward than dressing up someone in white clothes, sprinkling water on his/her head and rubbing it into his/her hair while people stare? Or, if you come from another tradition, what is odder than dunking the person in a religious bathtub, a pond, or some body of water while people stare? Wearing white in this case is also awkward because that means whatever is underneath is of great importance. Hmmm….do I go with the Steelers jersey underneath the white, see-through robe, or the Led Zeppelin t-shirt? Whether someone is baptized as an infant or a child, as a teenager or as an adult…we have to admit that this ceremony is a bit weird. So last Sunday I was asked to lead such a ceremony at a friend’s house. Mom and dad, two honest people, were just not sure what it was…a baptism, a dedication, a christening…what do these things mean and what we were actually going to do? What are these things and what are we going to do? 50+ people were staring intently at this baby boy all dressed in white and screaming his eyelids out. He was red in the face; would he ever stop crying? Mom and dad tried to soothe him and so did the two godparents looking on. But he just wailed louder. I finally put the water on his head. First time [Creator]: kid is still screaming. Second time [Jesus]: tears rolling down like a waterfall. Third time will be the charm, right? Spirit: he didn’t like it one bit. Even his dad was like…geez, this kid is not content right now. So I said the blessing and a benediction—as fast as I could. Poor kid—he probably just wanted to eat; or sleep; or get the diaper changed. And here I was talking about him to all those people and asking his parents questions and then putting water on his head and oh, that white outfit just wasn’t a good look for him. I don’t blame him for crying. Man, these baptism/dedication/christening things are so weird. I still think that the parent’s questions were right on. What is this and what are we going to do? 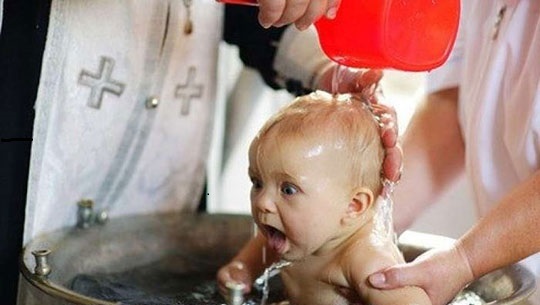 What is this Christian rite of baptism [just another way of saying tradition]? What is this so-called sacrament? There are a hundred different answers and it depends on your tradition. For the sake of time, let’s just say that a sacrament in general terms is a ceremony or ritual that has some sort of religious or spiritual significance. But some people take that much more seriously than others. I would argue, though, that most people take it just about as seriously as my two friends who had their kid screaming through the whole thing. They both wanted to do something to mark the occasion of the birth of their child. They wanted family and friends to be there and experience it. They wanted to celebrate and eat and drink. But it was less about religious tradition and more about all that other stuff. For the house was filled with Catholics, all kinds of Protestants, and plenty of agnostics/atheists and non-religious folks. The water ceremony—at least for me—is more about identity and community than anything else. I said this to the whole group gathered: it takes a whole village to raise a child. I asked them to agree to be part of that village. 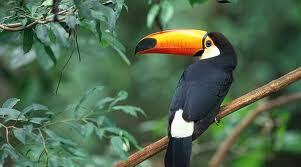 I asked mom and dad to agree to give freedom to their kid to explore spirituality and to ask questions. I asked the godparents be honest and to be mentors. And I reminded everybody that this crying baby was….a baby. All of this won’t be remembered. He will have no recollection of the so-called sacrament. Even one day when he’s older and people show him pictures, he will still not directly connect to that experience. It was, in all honesty, a moment for the adults—the friends and family—to embrace each other and their commitment to be the village that raises the kid. That question is yet to be answered. The kid, as he grows up, will answer with his own life. His family and friends will answer by how they accept and love him, mentor him, and teach him. Fortunately for him, it’s quite possible that he will never again have some strange guy rub water on his head or say strange words while he’s crying. You know, Jesus was baptized, too, but it was a lot different. It’s a story told by all 4 Gospels. Jesus wasn’t a baby, but an adult. And there was no ordained clergy to put water on his head in the name of the Trinity or whatever. Jesus’ baptism story must have been strange, because all 4 Gospels tell a very different version of the same event. Yep. The Gospels of the NT often tell very different versions of the same story. Why? In storytelling, the audience matters. Matthew, Mark, Luke, and John’s Gospels were all written for and to different people. So each Gospel tells its own story so as to make sense to the hearers. Matthew’s version includes a unique dialogue between John and Jesus. John is hesitant to baptize Jesus. “No, Jesus, I should be baptized by you—not the other way around.” It’s almost like a “you first, no you first” kind of kid’s game. Well, that happens until Jesus reassures John that it’s okay for John to be the baptizer. Jesus literally tells John: Release it. Let it go. All the ideas of hierarchical relationships—who should baptize, who should be baptized, religious rites, etc.—let it go. This is a clear attempt by Matthew to address some controversy in the early church. You see, some people were uncomfortable with Jesus being baptized by someone else. That would imply John in the role of priest and Jesus as underneath John. At least, that was their worldview. But that’s not all. 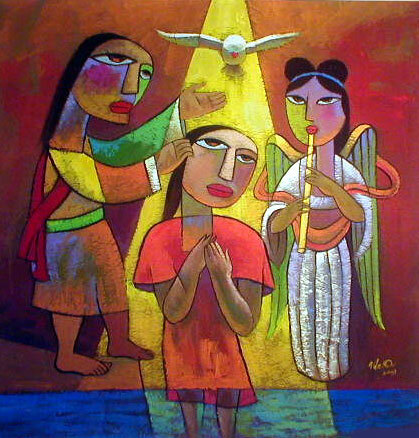 Many wondered: isn’t baptism supposed to be reserved for sinners? So how in the world could Jesus be baptized? Some people believed that Jesus was without sin. So to them, this makes no sense! Matthew’s Gospel is of course making a point—or at least trying to. Unfortunately, many so-called religious people limit the waters of baptism to a chosen few—people they choose. But Jesus, in Matthew’s story, contradicts that. Water [and baptism] is for everyone. It’s for all who are not perfect. 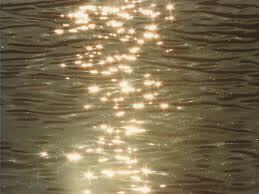 Jesus is on the same level as us; he is immersed in water just like anybody else; he identifies as real person. The heavens open, but not to prove some sort of religious doctrine or to fit into church hierarchy. The heavens open to mark the occasion as important, for sure. Pay attention, world. God doesn’t show favoritism. God is pleased because God desires for humans to understand identity. God is not some cold, non-empathetic deity equipped with rotating, exploding judgment lightning bolts, although that might be a cool anime movie. Instead, God understands suffering, and crying, and doubt, and fear, and love, and curiosity, and confusion, and humanity…as it is. 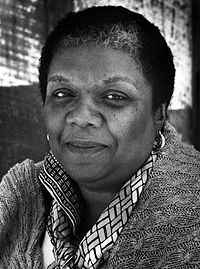 People have tried for so long [and still try] to say that God only loves some people and only cares about my people and not them; and people still say this person who is gay or lesbian or Arab or from another land or speaking a different language or someone who is just plain different is outside of grace and mercy. Here’s the thing—if someone is never baptized formally in a church or even in a house—this is not really important. Now some people will NOT like this on FB or repost this, for sure. But questions are much more important than the ceremony. And how we treat people is way more important than baptism. So what is this water? Water itself is a flowing, renewing, refreshing source of life for all living things—including us. When babies are well, babies—they are almost ALL water [75-78%]. That’s why they are so squishy. Water is part of our physical makeup. The rest of us are 50-60% water. We need it in order to survive. When the heavens open, so to speak, water comes down in the form of rain or snow. So if you need to, forget the word baptism. Forget the word sacrament. But remember to notice water. Water is a sign of life. And water is provided for the whole planet. Water should be available to everybody in the world. The fact that some people in our world do not have access to water is a sign of our degrading humanity and our need to change. Water itself is essential—not to be a symbol for religions to argue about—but as a physical source of life. And focus on identity. Because the second question of what will we do is one we must ask every day of our lives. It doesn’t matter if you’re an infant, a kid, a youth, or an adult. I think that God still speaks to anyone and everyone. Yes, we all talk about that differently and that’s fine. But I do think that God is still communicating with us. And I do think that God is pleased with people as they are. There is no hierarchy in humanity. We have created this lie ourselves. No one is more important than another, no one loved more or blessed more. We don’t have to wear white outfits or jump through religious hoops for God to love and accept us. God is pleased with how you are you. If you have ever been made to feel or have ever been told that the waters of healing, compassion, and purpose aren’t meant for you, then let the water wash over you. Put those harmful words aside. Let them go. Anyone who excludes certain people is just trying to control the water. But the water is strong and free to flow and move as it will. Just as God’s love is free to flow and move as it will. I was at a Bat Mitzvah yesterday, and the girl chose this poem to be read in her rite of passage ceremony. It is a beautiful way to finish this. Water you can notice every day. It pours from the sky and comes up from the ground. It is not limited to a sacrament or a building or a church. Water is the still speaking, still flowing creator at work. And so be baptized, sprinkled, immersed, washed, refreshed and renewed by it every day. And be inspired to love, to show compassion to others…and be inspired to forgive. Because we are all filled with and surrounded by water….all of us. May the rivers carry us on our journey and lead us to live with love. May the still speaking and flowing water move through us and be shared with all creation.